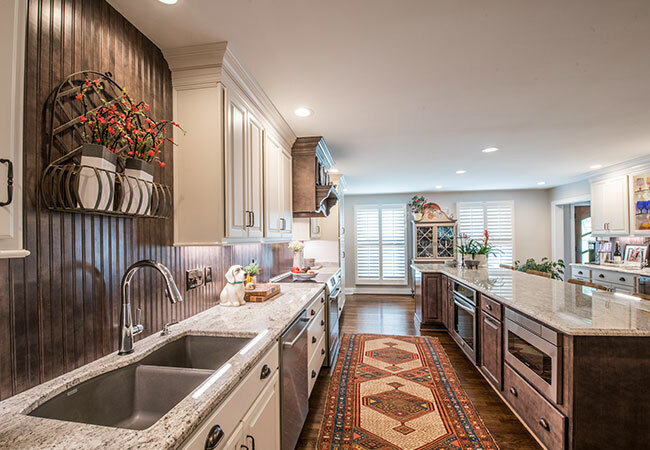 Click through the slideshow to see these amazing remodels by various companies in the Lexington area! 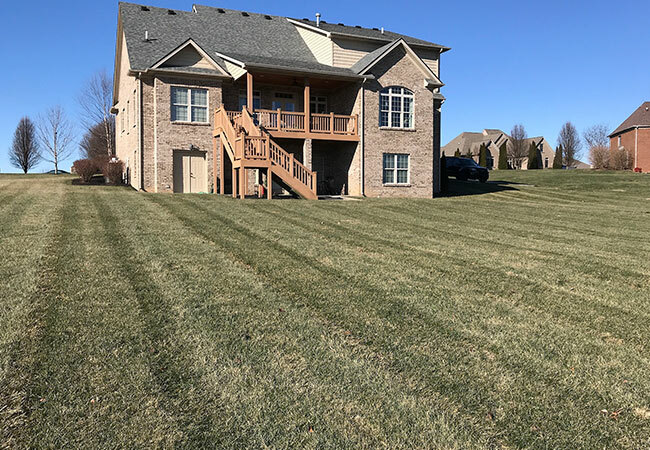 This Hartland home was just like many others in the neighborhood: great location with mature trees and curb appeal but lacked an open floor plan, functionality and amenities of a new home. How did you help achieve your client’s vision? The clients left this remodel, design and product selections up to local designer Mary Lou Yeary, Conrad Construction and Kitchen Concepts. 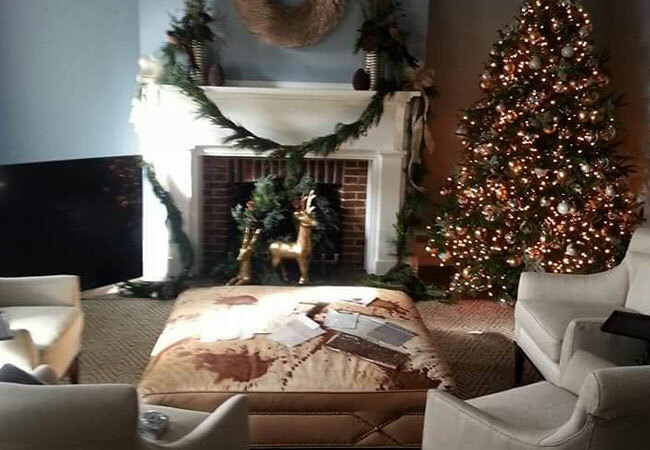 They did have a wish list that consisted of natural light, a dining room that would be used because of its location and a comfortable, open kitchen and butler pantry area that worked for family meals as well as entertaining. What is your favorite design element of the project? 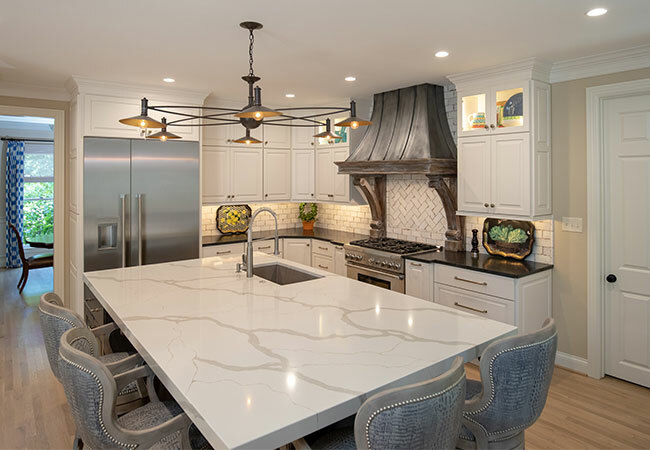 There are a number of favorites on this project but the items that set this project apart are the custom zinc hood with large brackets that accent the height of the room and a butler pantry that flanks the kitchen and appears to be a piece of furniture. What sets Kitchen Concepts apart from others in your industry? We are very open-minded and full of ideas. We work as a team and offer a variety of products to achieve the customer’s goals. 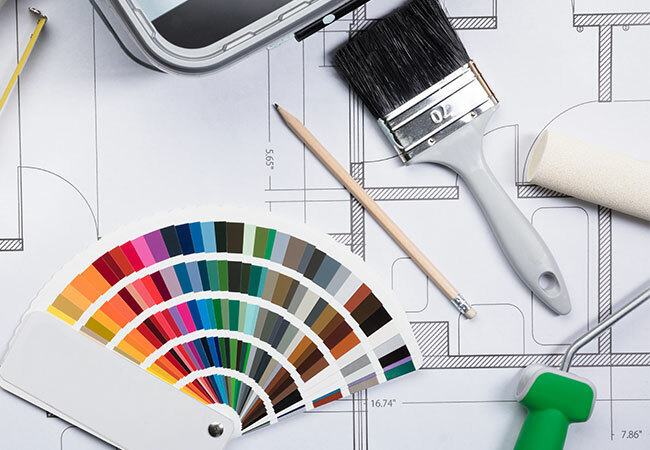 What advice would you give a homeowner looking to renovate? I always advise every homeowner to do their homework prior to making a decision on a remodel. The key components of a remodel should be quality, price and time frame. Communication and setting expectations on these three items make for an enjoyable project for everyone. 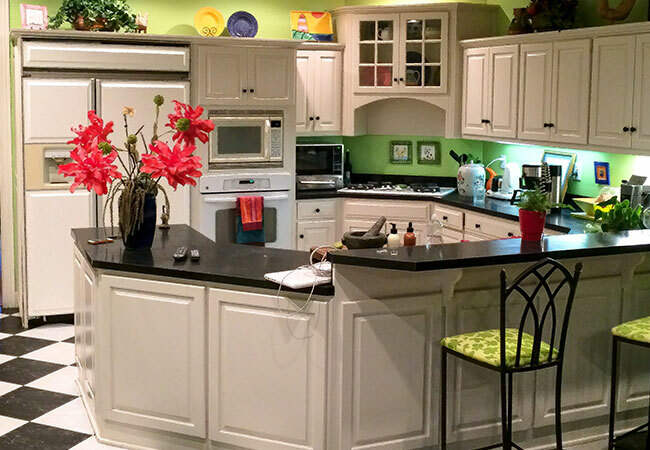 This project was a complete kitchen and dining remodel. 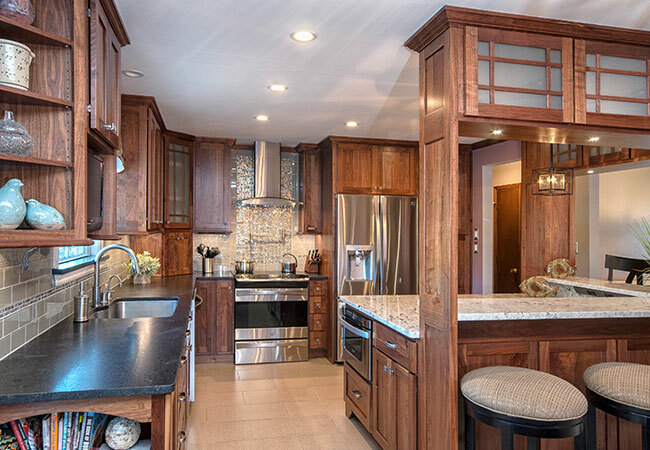 The client wanted custom full-height walnut cabinets with a modern/mission style. They needed more storage and countertops. They also wanted to open the kitchen up to the adjoining family room for better flow when entertaining. 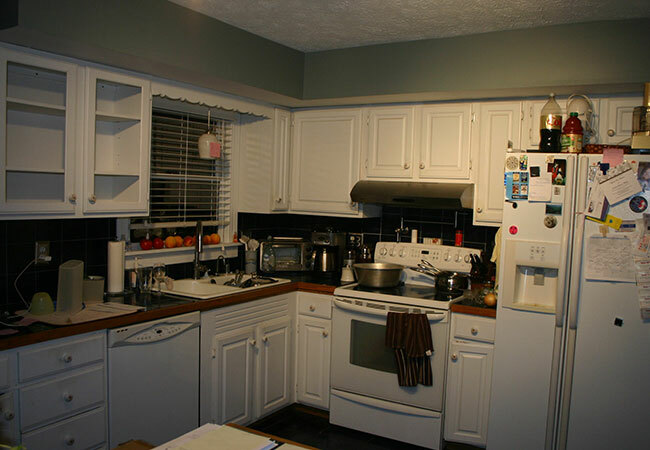 The kitchen includes every soft close, storage, and pullout feature that was possible! The kitchen and dining room were only 12x12 each so we had small spaces to work with. I believe Interior Design is really creating “art” we live in. I love creating something unique and beautiful that my clients can enjoy for years to come! 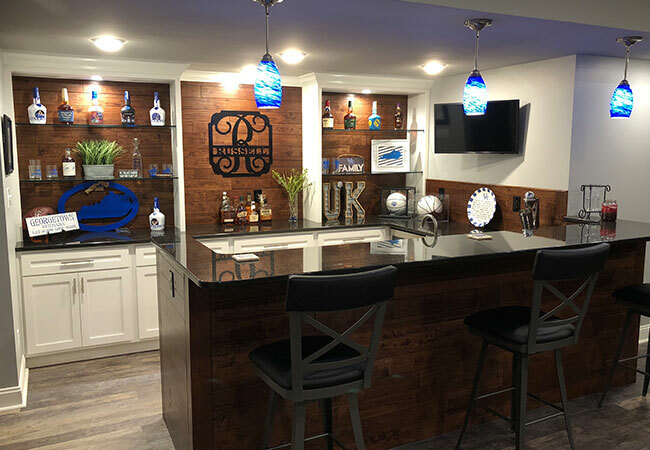 The customer wanted all the amentities of the kitchen in their basement without the kitchenette feel, so we first gave them a basic design and had a few question/answer meetings before we started the project to address their needs. The wall board behind the shelves with glass shelving and lighting in the top of the cabinets really is a nice touch. We strive to meet the customers needs, timeline and budget without taking any shortcuts. It’s important to feel confident that your contractor can meet these expectations, so it’s critical to do your research and get multiple bids. 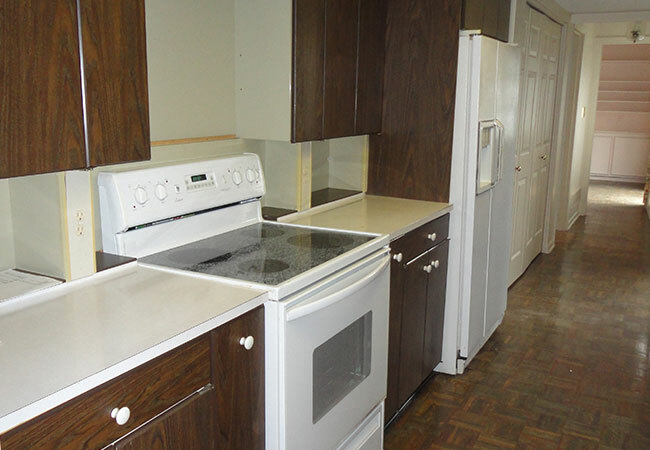 This kitchen had all of the original finishes from the 1978 installation. The walkway was narrow, the cabinets were not accommodating to modern living, and the finishes were dark and dated. 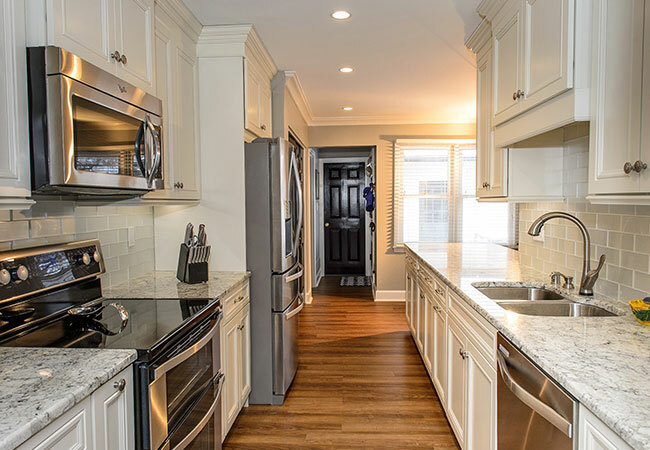 We chose light and bright finishes, added updated features such as granite countertops and LVT flooring, raised the ceiling and replaced old fluorescent lighting with can lights. We also cut out half of the wall between the dining room and kitchen in an effort to marry the two spaces. Doing so allows the countertop to be used as a serving area for dinner parties. The granite is the piece that ties the whole space together. This house is a patio home, so some of the neighbor’s electrical wires ran through the attic of this house. When we opened up the ceiling to raise it, we discovered that not all of the wires ran through the trusses like they should. So, the electricians had to shut down power to 4 consecutive units one afternoon and re-work the wiring to accommodate the higher ceiling. What advice would you give a home owner looking to renovate? Be patient. Rome was not built in a day, and every project has its own set of challenges. Expect some bumps along the way and rely on your team of experts to guide you through the process. The Aurora Ave project is a 1930’s bungalow in the popular Kenwick neighborhood. To keep up with today’s lifestyle, we wanted to get rid of the smaller rooms and expand the living space to create a layout that provided the most function. 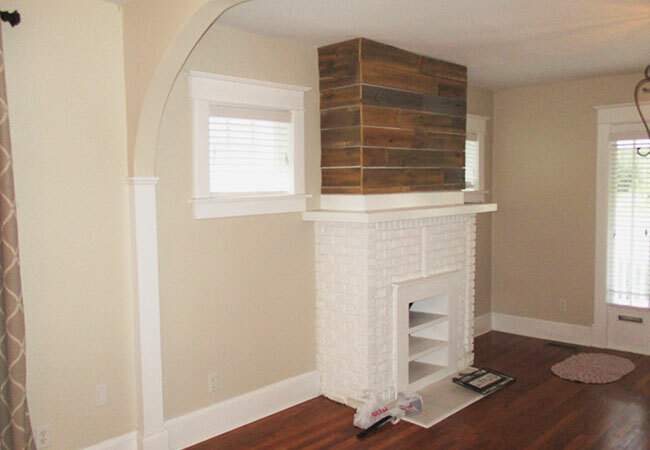 The homeowner wanted the new addition to look as though it was original. To preserve the time period, our talented carpenters created custom pieces, such as built-ins around the antique mantel. In the existing kitchen, there was an old chimney chase that had been plastered over. 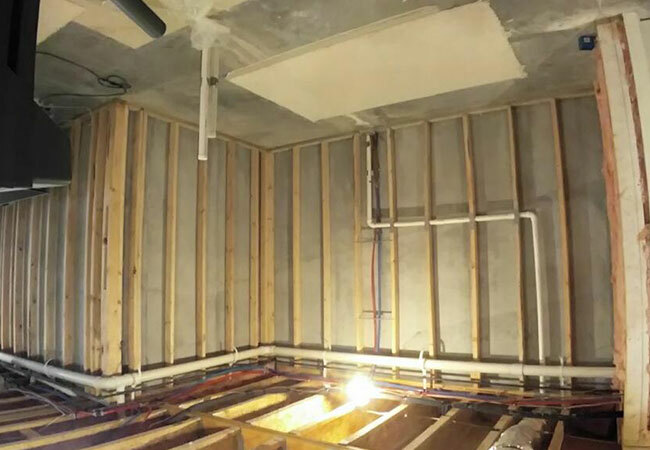 While our client loved the idea of having it exposed, the condition of the piece did not allow for that plan, giving our design team a chance to shine by applying a wood mold veneer brick over the plaster. This material is fantastic because it is made to resemble old weathered brick making it feel as though it’s been there forever. When pulling up the kitchen floor it was discovered that there wasn’t an actual sub-floor. This created quite the problem when toothing in the existing floor to the addition. Our lead carpenter on the project was able to create a solution leaving the existing floor more stable, safe and level. The replicated arched opening between the kitchen and new living room addition is our favorite design element of this project, because it allowed us to match the existing arch in the front of the house. It gives the feel of being open-concept without feeling like one big room. Everything flows so nicely, you would have never known that the space was added on. Working within the community you grew up in is truly a pleasure. The best thing about Lexington and the surrounding areas is the people and its history. Taking aged homes and turning them into something fresh and current while respecting the original design. Each project is a story; turning a few Pinterest images from a client’s tablet into a space that will make an imprint on their lives. That’s what’s most satisfying… watching all the hard work pay off with truly satisfied clients enjoying their newly remodeled spaces. 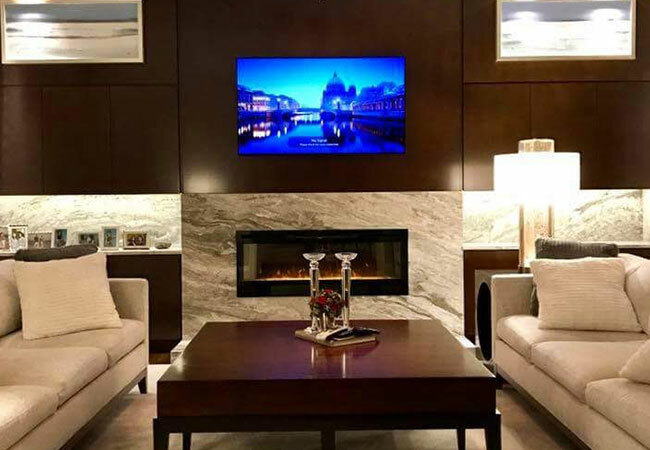 We are an experienced, full service residential and commercial interior design firm, offering sevices for any interior needs from something as simple as window treatments to designing the interior of a home or building under construction. My job was to execute the owner’s vision for an urban lifestyle in the downtown area. From the street the facade presents a very simple historic townhouse and his desire was for me to create a New York penthouse decor. We retained the original wood plank floors, exposed brick and wood beams in other areas of the home so the contemporary along with the old features from days past creates a stimulating contrast. The contemporary chandeliers were the finishing touch to create that WOW factor. Seek design professional help and work with an experienced professional to help avoid costly mistakes! A designer knows products and materials and should get you the best value for your money. How did you help achieve your client’s vision for this outdoor living space? We were able to create a cohesive environment that’s both beautiful, and livable so the family can enjoy the space together. The clients were thrilled with the result, including privacy for the pool, jump rock for the kids and landscape lighting for dad. Relocation of septic lines to accommodate pool placement and adding increased electric service were the two main construction challenges. Nature’s Expressions has many in-house trades. 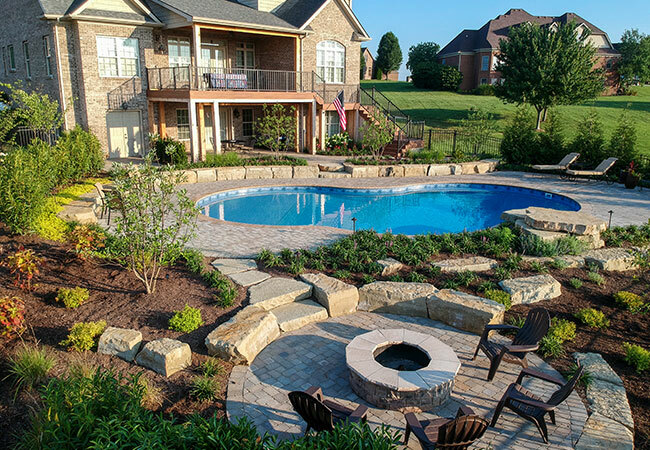 We have pool builders, machine operators, carpenters, masons, and skilled horticulturalists. Our design team engages with the construction supervisors giving them confidence to implement the project in a way that’s consistent with what the client envisioned. 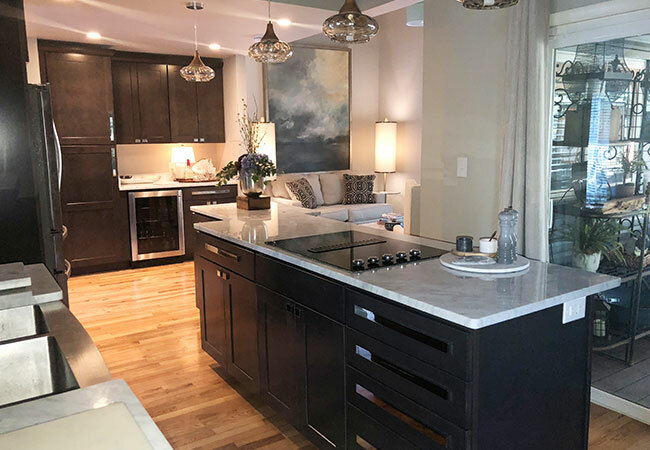 This was a full kitchen remodel by Nick Keitz of Keitz Construction, in collaboration with Mary Lou Yeary of Gallery Interiors, Jennifer Clifton of Quality Stone Countertops for the Granite as well as SL Designs for cabinetry. Communication is always key to getting good results; it’s imperative to listen to your clients. Yes we had to add a column in the kitchen we had to work around from the removal of multiple walls, but we came up with a great solution of incorporating it into the island. What is your favorite element of the project? I love the flow of the space and that it is functional for multiple people to be working in the kitchen at the same time. Client response—Seeing how much people love their new spaces after the job is completed is incredibly satisfying. 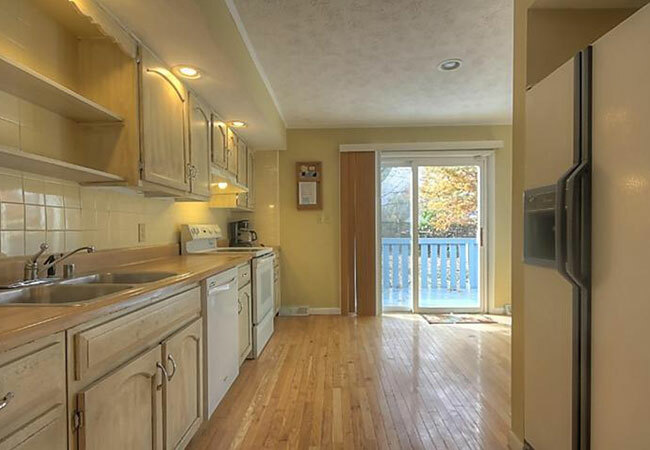 Describe what this kitchen was like before. 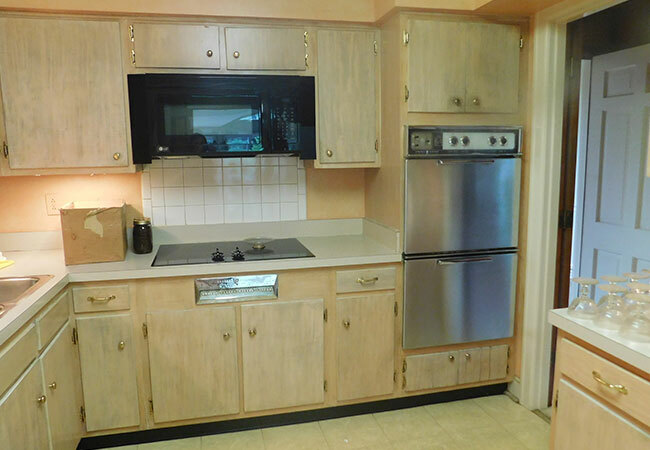 The original 1978 kitchen needed a complete overhaul. The homeowners love to cook and entertain. An open design, with defined areas was key, so we moved a few walls, proposed a new layout and dove right in! The homeowner’s favorite part of the new space is the 11-foot island that flows into an intimate seating area, making conversation easy. Moving the walls meant structural changes, which lenghthened the timeframe, but ultimately, we achieved the desired result. Patience is key when remodeling a home. What sets House apart from other businesses in your industry? 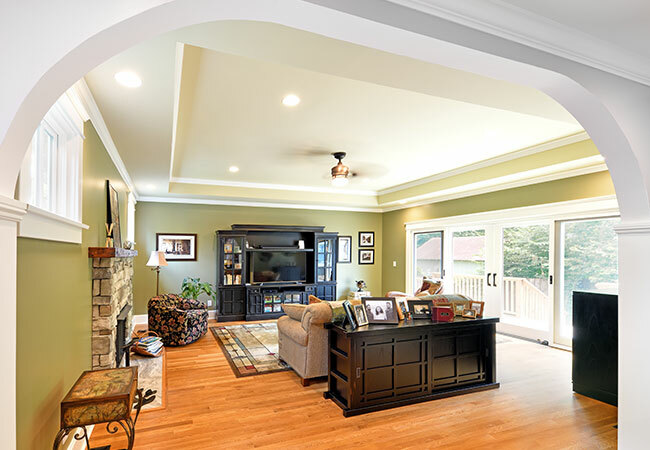 accessory to remodeling an entire home, we can pinpoint and achieve the best result for any style. There are a number of interior design companies in the Lexignton area that do fabulous work. The possibilites are endless when you partner with some of Lexignton's most creative minds. Work with any of these businesses to transform your house, and realize the home of your dreams!